A chilling destiny she can’t escape. He reached for my shoulders and drew me against his chest. “I’ll make sure to remind you that you said that, okay? When you’re running away from me as fast as you can.” Excerpt from Kristi's website. 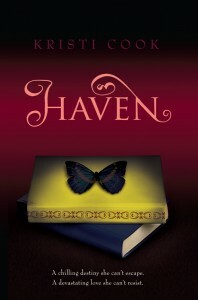 Haven was a refreshing read I really enjoyed this book! Debut author Kristi Cook has created a world where having an ability isn't a bad thing. Violet is a stong heroine dealing with scary visions of the future. At first she thinks she's crazy, but when she enrolls at the Winterhaven boarding school in New York she come's to realize that she isn't. Every other student at the school has an ability of some kind. She soon fits in and forms close friendships with her roommate Cece and her group of friends Kate, Sophie, and Marissa. Violet also has a secret destiny that even she knows nothing about. Enter Adian Gray the love interest for Violet I like that Kristi didn't write a love triangle as they are kind of being overdone at the moment. Aidan is very secretive and it drives Violet crazy but it's as if they instantly connect.Her visions start to revolve around Aidan and his possible death, she does everything to help save Aidan even if it means giving up her own life. I really felt the connection between the two was genuine I was pulling for this couple to come out of everything unscathed. There was a suprising villian in the book that I did not expect and I can't say much more as it would spoil the book but you will definitely be suprised with the outcome. I cannot wait for the next book in this series I want to read more of Violet, Aidan and their friends. If Winterhaven was a real school I would have wanted to go there for sure :) Thanks Kristi for the galley! !